Sulfurea Nar albus aqua fontesque Velini. The Veline fountains, and sulphureous Nar (shake at the baleful blast). Virgil - Aeneid - Book 7 where the poet describes the effects of the horn of war sound on the rivers near Rome. The Nar River (It. 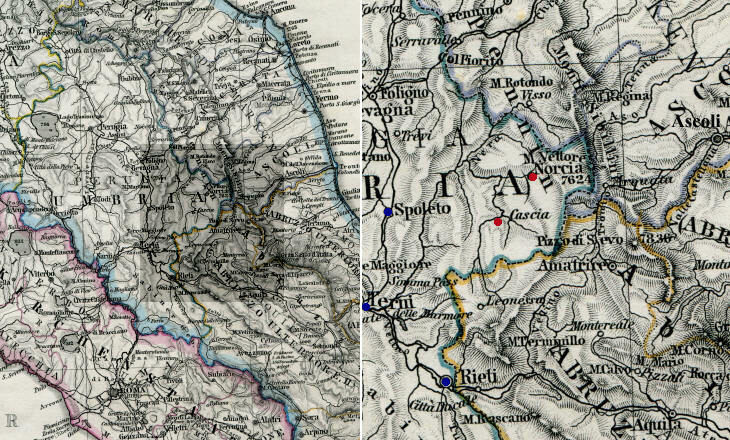 Nera) mentioned by Vergil crosses southern Umbria and empties into the Tiber near Orte. Valnerina is the name given to the valley of the Nera from its source to its junction with the Velino, the river which crosses Rieti. 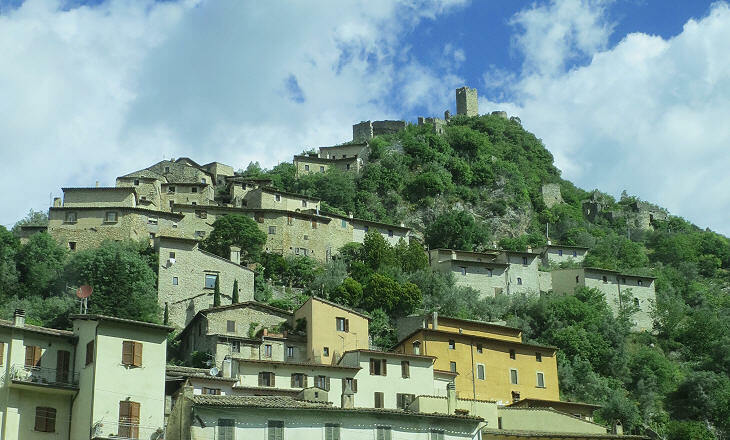 Valnerina is situated in a very central position on the Italian peninsula, but it is scarcely populated with just a few castles and villages at the top of the hills. There are almost no buildings near the river, which, due to the narrowness of the valley, often flooded it. 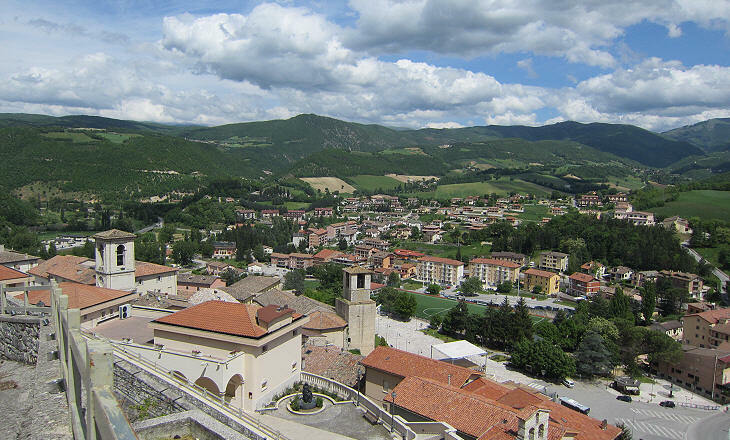 Cascia and Norcia, the two main towns of Valnerina are located in side valleys where the mountains open up to create a hollow. 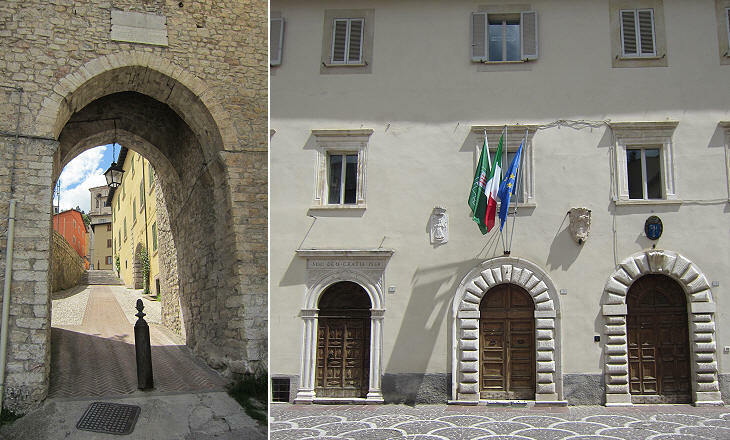 Tourist agencies advertise Umbria as "The Green Heart of Italy" and there is some truth in what they say. Nearly 40% of Umbria is covered by woods and the percentage in Valnerina is much higher, because the decrease in population has minimized the growth of urban areas and the remoteness from large towns has not favoured second home developments. All Italians immediately associate Cascia with St. Rita. The faithful because of the many miracles which they believe occurred thanks to the saint's intercession. 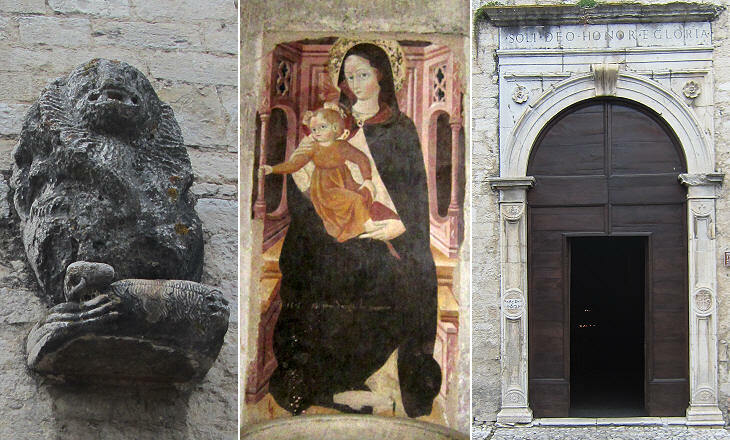 Secular Italians instead are amazed by some aspects of her life; according to tradition she prayed for her two sons not to take revenge over the killing of their father; her prayers were fulfilled and the sons fell ill and died before they could take any action. St. Rita was born at Roccaporena near Cascia in 1381 and she died in 1457, but only in 1626 she was beatified by Pope Urban VIII. In 1665 a church was dedicated to her in Rome. She was canonized in 1900, which indicates that the Roman Church was very cautious in dealing with the many miracles attributed to her. Eventually the Holy See promoted the construction of a large (out of context) church designed by Mons. Spirito Maria Chiappetta in 1937-41. The damage to the urban layout of Cascia was increased by the pulling down of many old buildings to make room for facilities for pilgrims. 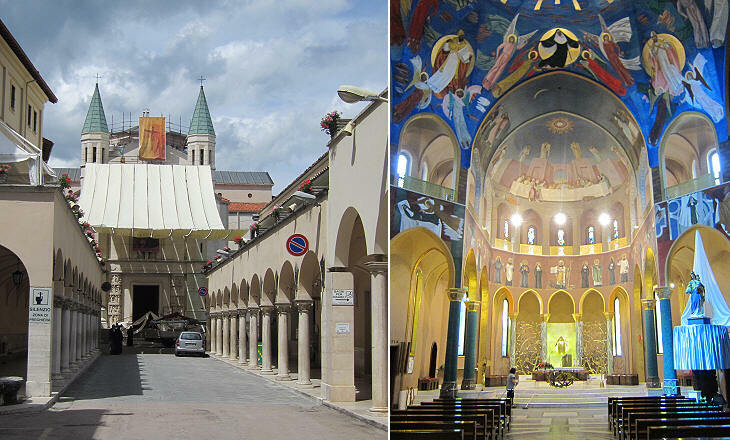 Valnerina is situated in a highly seismic area and Cascia was struck by major earthquakes in 1300, 1599 and 1703. Its churches were rebuilt after each earthquake, but they retain some elements of the previous buildings as at S. Maria, which was the main church of the town until the construction of the basilica. S. Francesco was built in 1424 on the site of a previous church. Similar to many other Franciscan churches it was located in a peripheral area of the town. The interior was largely renovated after the 1599 and 1703 earthquakes, but the façade with its nice Gothic portal and rose window was not significantly damaged. 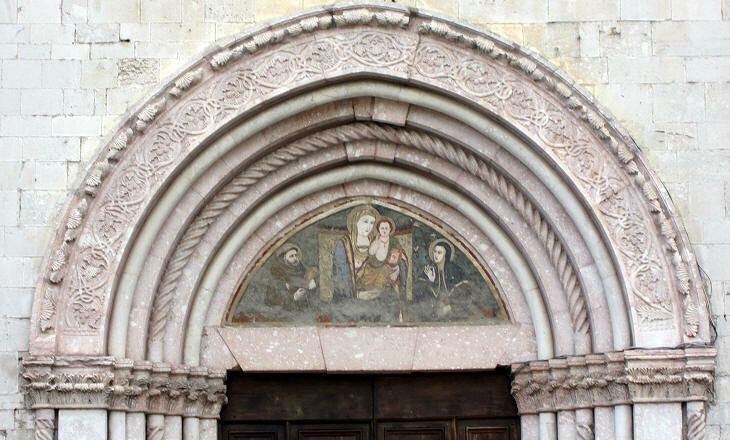 The use of a pink stone is typical of Umbria and in particular of the towns near Mt. 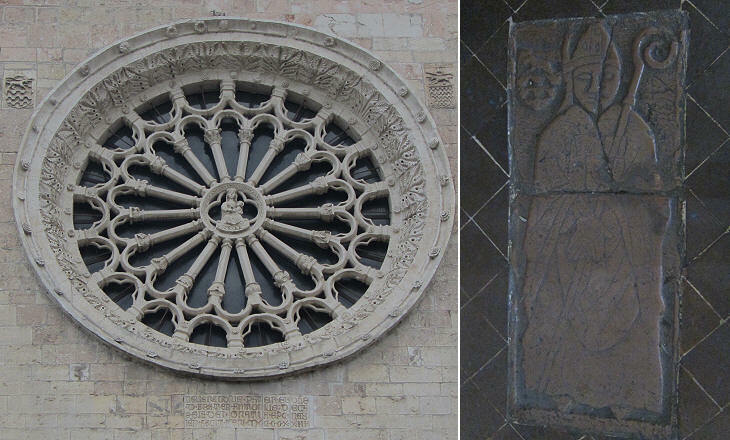 Subasio such as Assisi and Foligno where the stone was quarried. S. Francesco was built at the initiative of Bishop Antonio da Cascia who wanted to be remembered by his fellow-citizens. He was Bishop of Nebbio in Corsica and General Minister of the Order of Friars Minor. His name is quoted in an inscription below the rose window, his coat of arms is placed at the sides of it and finally his tombstone is the first thing one sees inside the church. A section of the walls which surrounded Cascia was pulled down to allow easier access to the sanctuary of the saint. The size of the remaining gates shows that the town itself was pretty small. According to the custom of the Papal State Cascia could not achieve the status of Città because it was not a bishopric seat. That meant it did not have tribunals, a seminary and other public buildings. 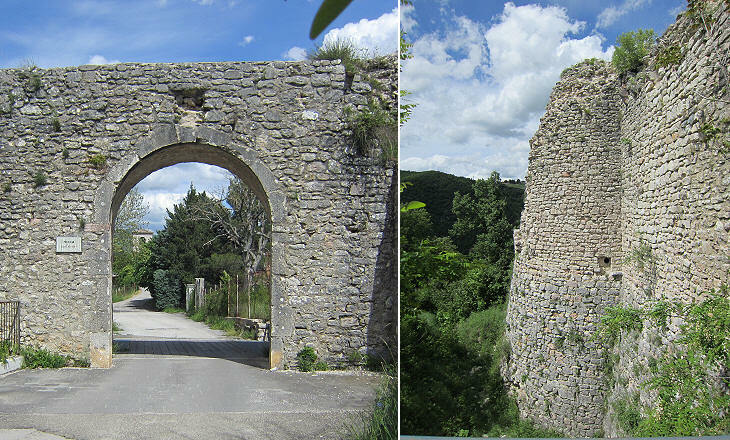 In 1465 Pope Paul II built a small fortress on the site of a previous castle at the top of the town. The purpose of the pope was to quell the revolts which from time to time broke out against the heavy taxation imposed by the Papal State. As a matter of fact the fortress was not properly garrisoned and the rebels managed to seize it on more than one occasion. Pope Leo X in 1517 decided that it was better to raze it to the ground. St. Rita desired to become a nun, but her parents forced her to marry. When eventually her husband and her two sons died she was able to follow her vocation and she joined an Augustinian nunnery in town. 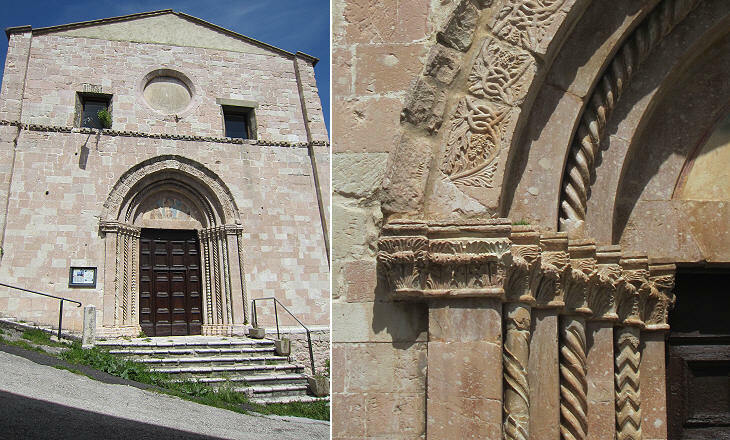 The Order had a monastery too near the fortress with a church built in 1380 which retains a fine portal. The image used as background for this page shows a modern relief at the basilica portraying St. Rita while she receives a stigmata on her forehead.